Team 100 volunteers recently delivered bags of groceries to students at Roosevelt Elementary School in an effort to prevent weekend hunger among needy families. The group of 100 men have raised money for the Volunteer Center's Food for Kids program, which delivers food to students at high-need schools on Fridays. The two groups work with the nonprofit Food Finders, which coordinates with food vendors, grocery stores, restaurants and caterers to distribute donated food. 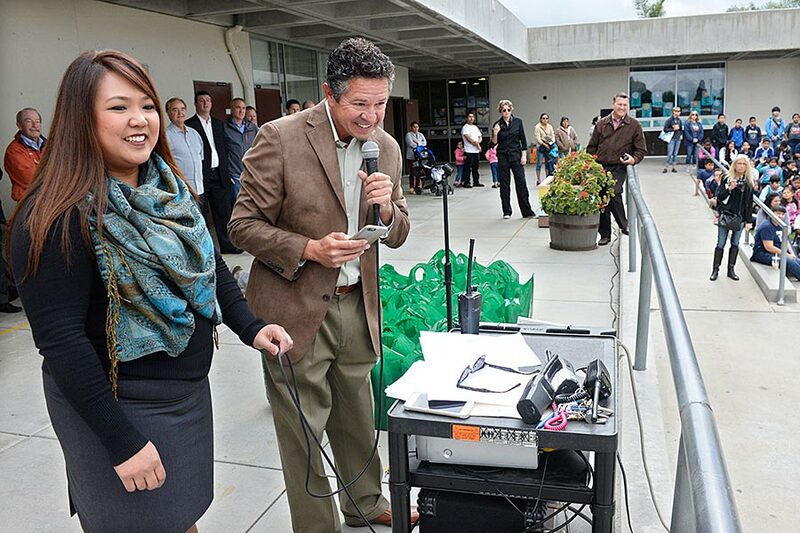 SPECIAL DELIVERY – Roosevelt Elementary School Principal Clarissa Tolentino and Team 100 President Tom Bennett speak with students before delivering bags of groceries to prevent weekend hunger among school children.